Last week I was MIA the entire week, so here’s a little play-by-play of what’s going on in my life. We were out of town until Tuesday night. Jaime had to go all the way to Lecce in Puglia for work and we decided to make a weekend trip out of it by going to Paestum along the way (more on that to come). Christmas is fast approaching and sort of sneaked up on us. We aren’t going home to the States this year, so we left the gift-buying and sending to the last minute and we are deeply paying for it with stress now. Last Wednesday, after we got back from our getaway, I was at home cleaning a huge terra cotta pot we bought in Paestum. Since we live in an apartment, it’s going to be kept inside for now. So there I was, in the spare bathroom cleaning this huge pot when I slipped on some water and totally smashed my left middle finger against the tub with the pot. The finger wasn’t broken, thankfully, but it was swollen to the point where that hand was completely useless and I’ve kinda been MIA not just on the web, but also in my home life. It wasn’t until Saturday night and yesterday that the swelling went down and I’ve been able to do slowly do things again. With all ten fingers once again in commission, I can finally write this post that’s been a long time coming. Being that this week is Christmas and next is New Years’, I’ll try to make one last post in 2014, but I’m not promising anything. 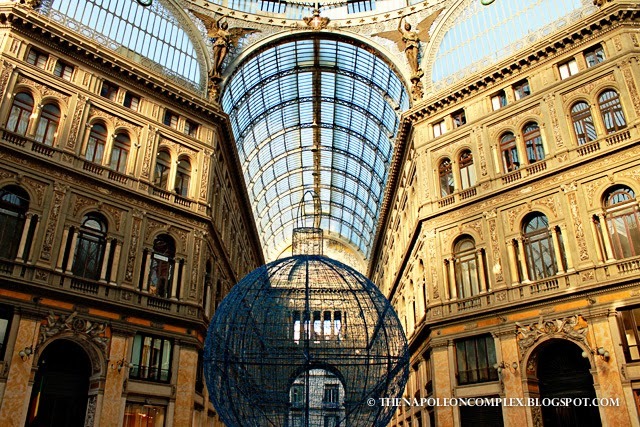 Anyway, without further ado, I give you… Naples! 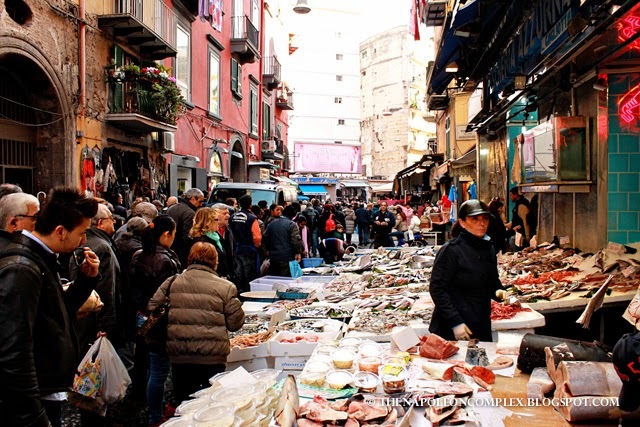 Everyone, Italians and Non-Italians has an opinion on Naples. Some are good, some are neutral, and some are bad. Before we had ever stepped foot in Rome, let alone Naples, we met a guy in Washington who had lived in Naples for a few years. He told us how him and his wife’s son was a baby back then and everywhere they went the Neapolitans would dote on this kid. If he went to a restaurant, the server or the owner would carry the baby and take him to the kitchen while they ate to show him off. I’ve never forgotten this story because this is the kind of image a lot of people have of Italy in general. 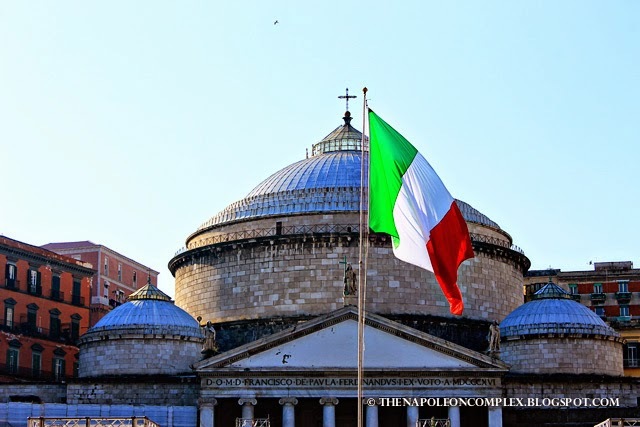 In reality, I am of the opinion that most of the things we as Americans imagine that is Italy is actually Naples (or Sicily, but I haven’t been there personally to assess this claim yet). 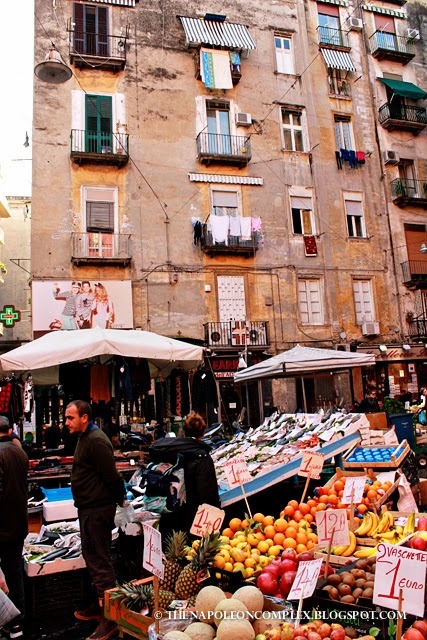 The red-checkered tablecloths, the streets bustling with people young and old buying their groceries in specialized shops, people shouting hello from the balconies to their neighbors as they hang their clothes to dry, a cook sitting with you to chat as you eat her food, Jaime and I have experiences all these things….in Naples (and the region of Campania in general). Before you write me off because you’ve experienced these things elsewhere in Italy, I’m not trying to say these things only happen in Campania, I’m just saying they’re more endemic to Campania (and of course this is a sweeping generalization and an entirely personal opinion so don’t hate me). 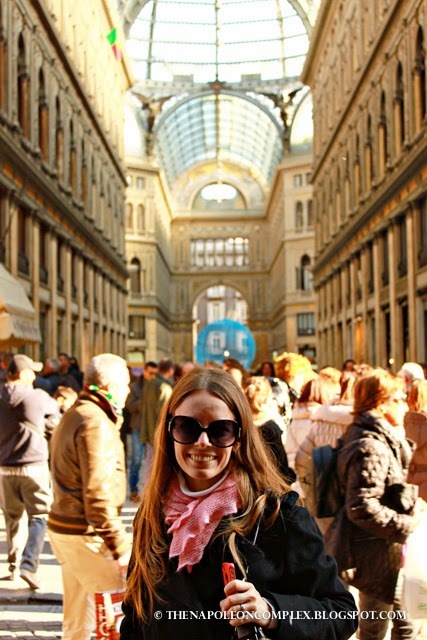 Naples is chaotic. 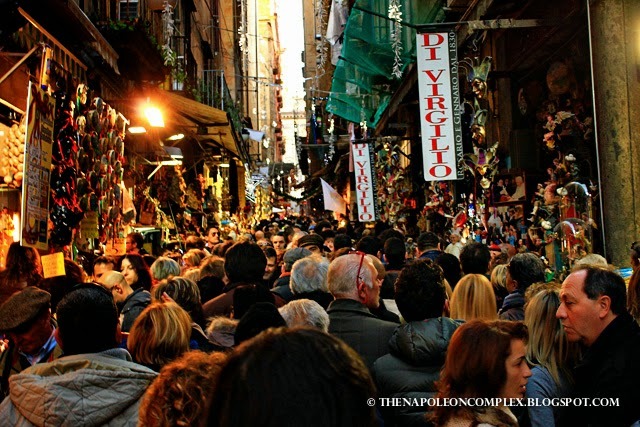 And if you think Rome or Florence is also chaotic, you would be right, but not in the same way Naples is chaotic. The driving and the complete lack of respect for any law is expected, of course, the same way it is expected in Rome, but these guys take it to another level. In Naples, you’ll see a family of three (mom, dad, and child) in a single Vespa, none with a helmet on. You’ll see someone in a Vespa carrying Ikea furniture in its box across their lap, or even trash bags full of clothes. Then, the trash bag will fly off in the middle of a main road, and they’ll stop traffic to pick it up and keep driving. You’ll drive through a narrow street and be able to touch the fish being sold in a market just by extending your hand out the window. And, if you’re a little taller than the average person, your head might brush against the sheets being hung to dry in the lowest balcony of a building. 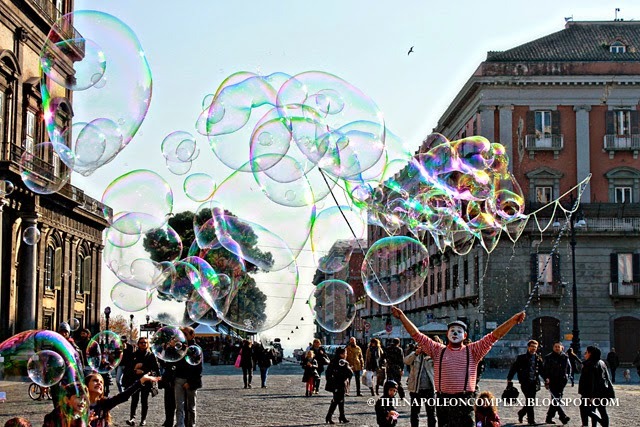 I don’t know about you, but these are things that have only happened to me in Naples (and those are all personal experiences). 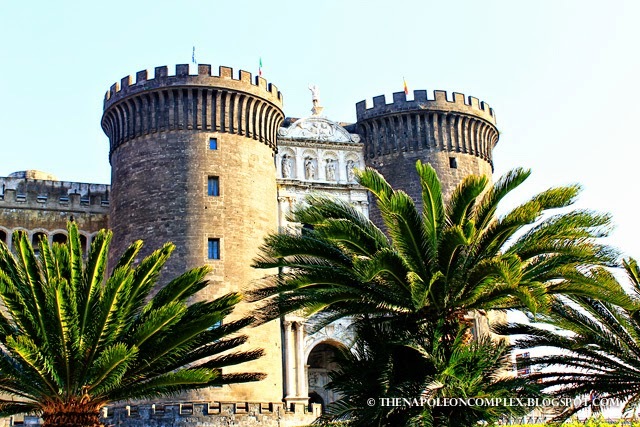 Naples is definitely not for everyone and I don’t think I’d be able to live there to be quite honest, but the craziness definitely gives Naples personality and character. 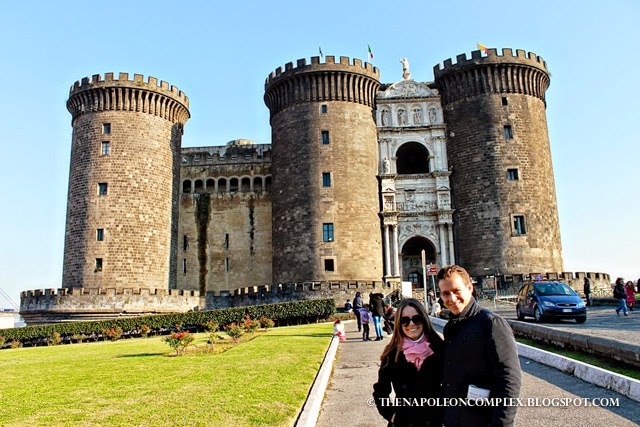 Last year, Jaime and I took a day trip to Naples. We’ve been back a few times since, but this was the one time we went on a train instead of driving (and I highly recommend you don’t drive). Obviously, Jaime’s coworkers gave us a few tips like don’t wear jewelry, keep your hands on your purse and your wallet in your front pockets at all times. I’m not quite sure if they were joking or not, but really, I don’t think it’s necessary to go to any extremes. 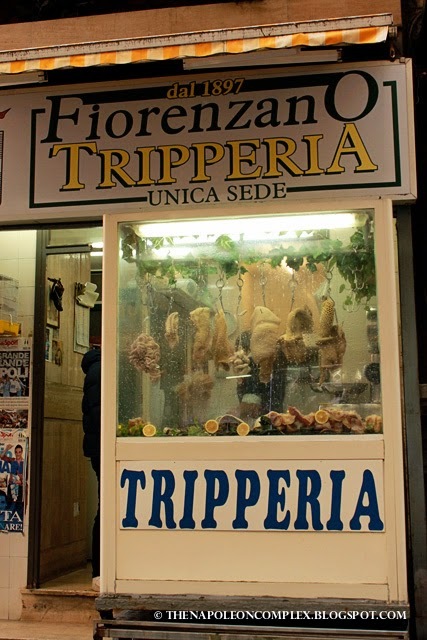 If you stick to the center, you should be only as weary as you would be in any other Italian city. When we arrived, it was like entering another world. 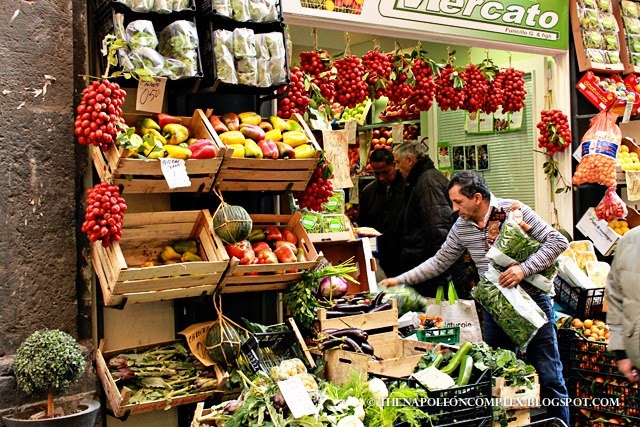 As I mentioned above, the streets were full of people and full of markets selling everything from meat and fish to fruits and vegetables. If you looked up, every single balcony or window on a building would have laundry hung out to dry (I have a theory that Italians have certain days when they all do laundry). As you pushed your way through the crowds, you’d also have to watch out for Vespas and Smart cars weaving their way through the crowds. 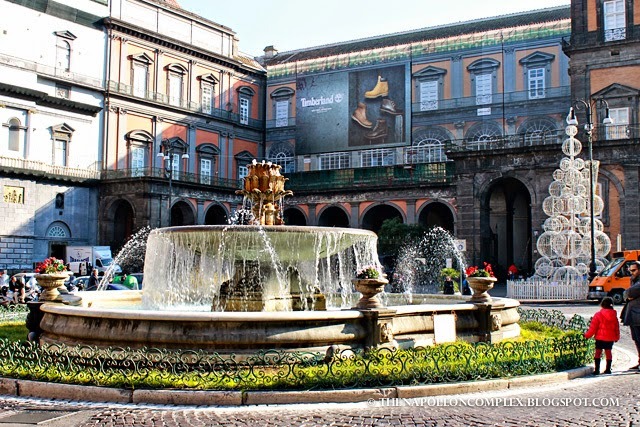 We mostly walked around the historic center that day, seeing the Piazza del Plebiscite, the Galleria Umberto I, the Castel Nuovo, and of course the Duomo of Naples. 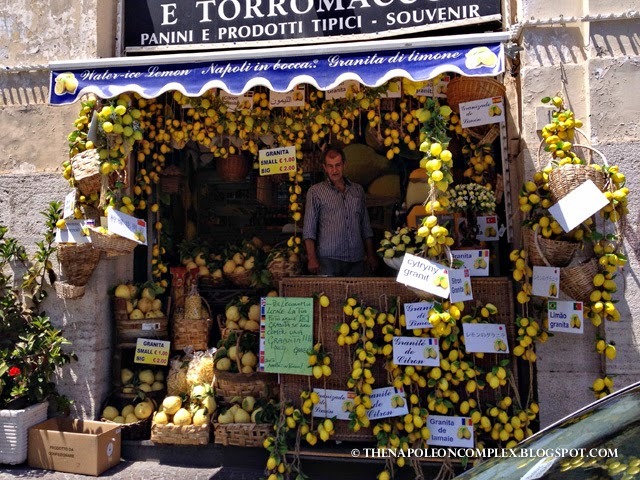 Really, I feel like I’ve only dipped my toes in everything Naples has to offer which is part of the reason I’ve been reluctant to write this post. 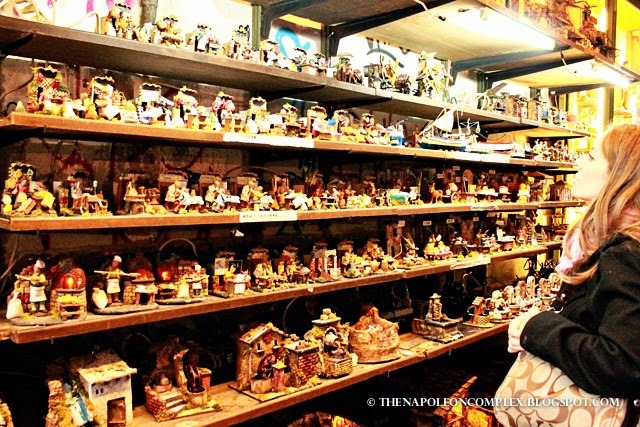 One of the major things we did that trip was stroll (more like push) our way through the Via San Gregorio Armeno, otherwise known as the street of the presepi, or nativity scenes. 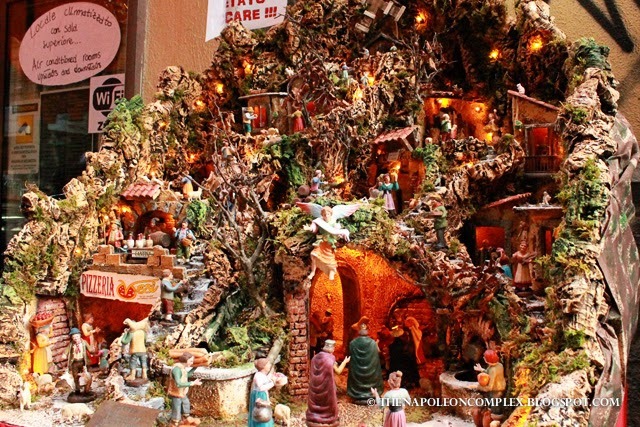 Naples is famous for its nativity scenes, which are never just Jesus, Mary, and Joseph. They include the entire village with many tiny little figurines. 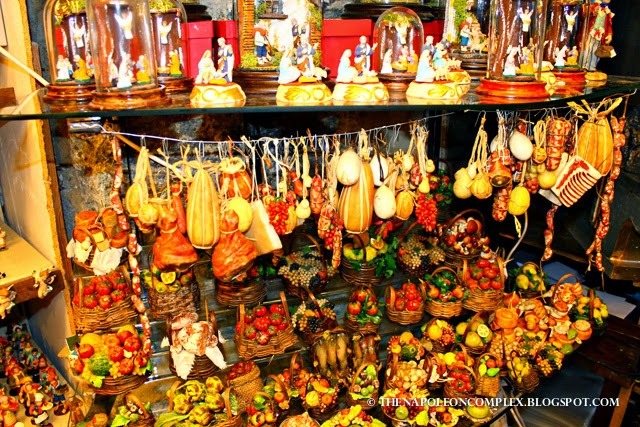 In this street, you can buy complete nativity sets (although they are not cheap) or you can buy individual figurines and build your own nativity scene. 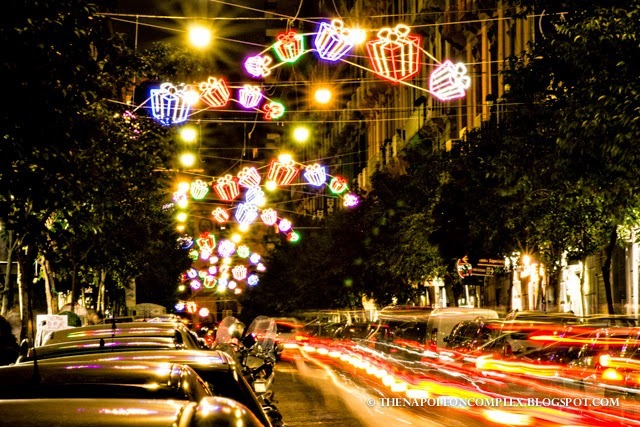 We went in December so it was prime time for everyone to make their Christmas shopping so the street was packed. And when I say packed, I mean you can get stampeded on if you fall. I don’t know if I’d go again this time of year, but it’s definitely worth a visit. Alright, let’s get down to the important part, right? 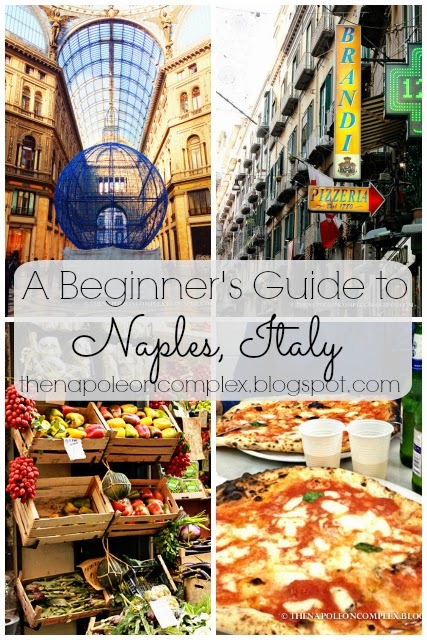 I’m a firm believer that regardless of the type of Italian experience you’re looking for, you need to go to Naples, if only for the pizza. Seriously, if you only have time to hop on a train, eat at a pizza place, and come back, do it. It is life changing. You can argue with me all you want that you like the thing and crispy Roman style pizza. I’ll think you’re crazy but whatever. 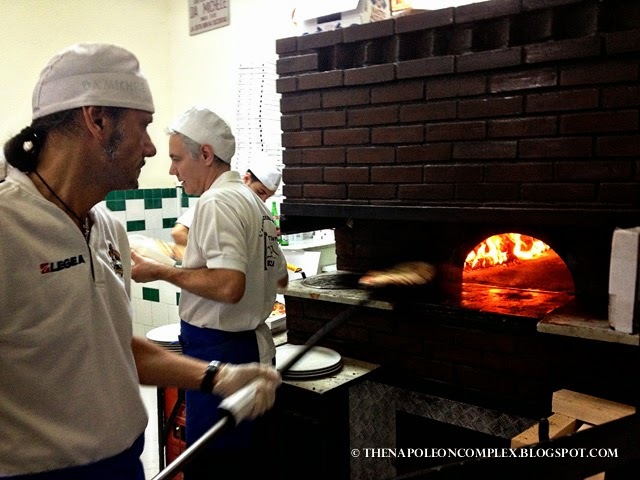 Either way, you just need to go to Naples if you’re in Italy to have some real pizza. And don’t be the person who later comments on TripAdvisor saying the pizza was soft, chewy, and slightly wet in the middle. Do your research, this is the way the real Neapolitan pizza is supposed to be! 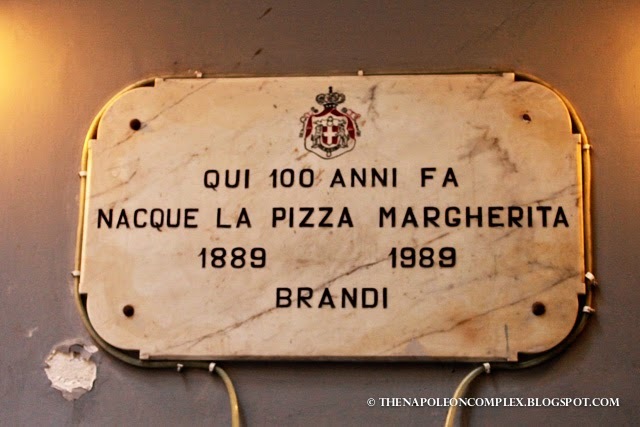 We’ve tried two different pizza places in Naples: Brandi and Da Michele. 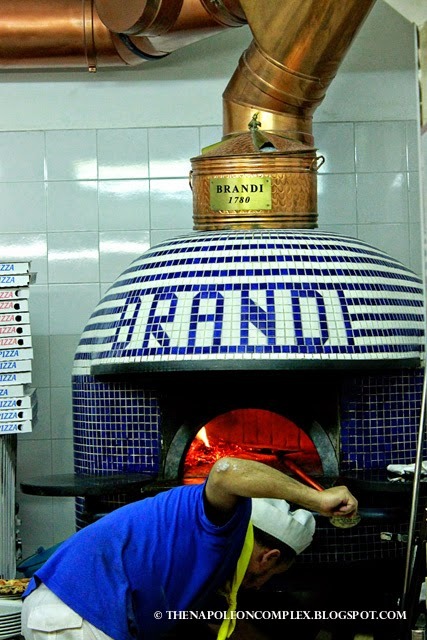 Brandi is famous for being the birthplace of the Margherita pizza (mozzarella, tomato, and basil). What else can we say? It’s very good pizza. We’ve been here twice, both times in the noon to 2pm range and never have had to make a reservation. 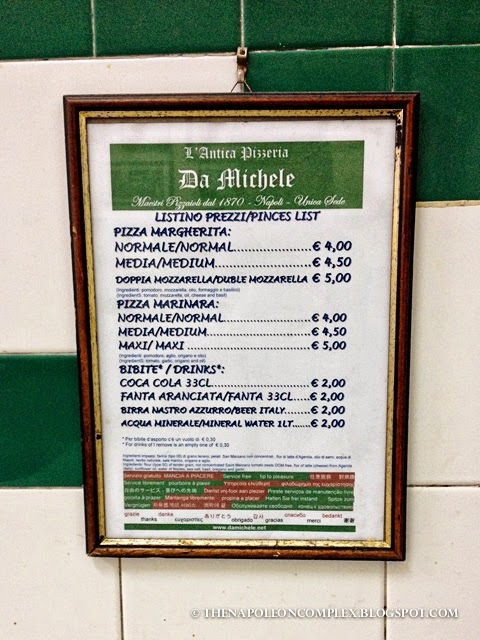 The prices are kind of high for Naples pizza, in the 9-12€ range, but you’re in Naples! Eat your pizza! 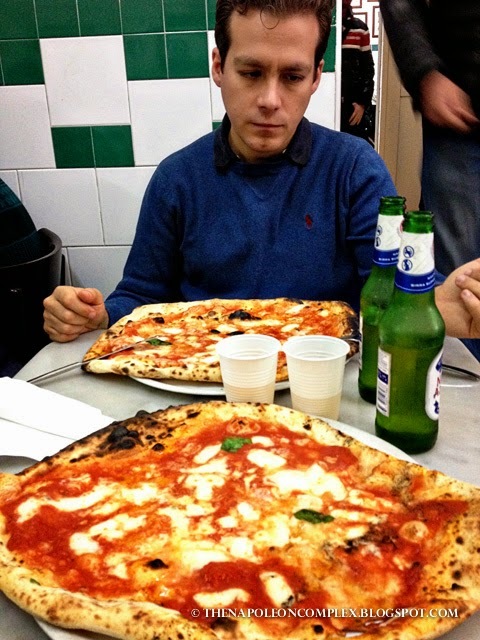 Da Michele is pretty much the star of Neapolitan pizza. 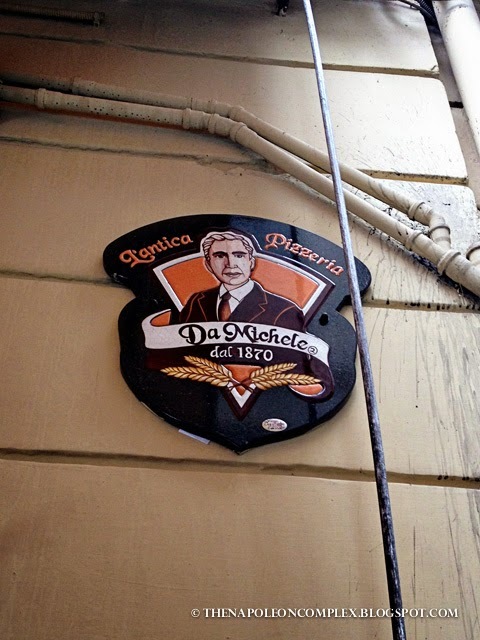 If you search online for the best pizzerias in Naples, Da Michele will always be on the list. Skeptics will say its popularity is due to the fact that Julia Roberts ate pizza here in the movie Eat, Pray, Love, but don’t be fooled. This place has been famous way before that movie. Its fame has its drawbacks. The lines are always long. 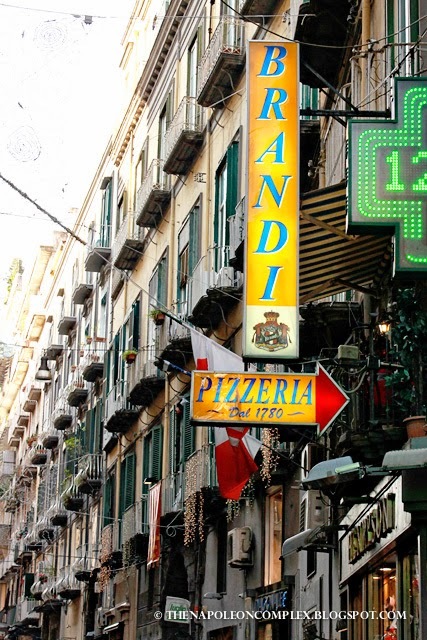 Of course the pizza is worth it, but honestly I don’t think you should wait more than an hour, only because this is Naples and there are a lot of pizzerias that are just as good. We went last Tuesday on the way back to Rome, and only waited about 10 minutes before we were seated. Note: I am enbarrassed to say that before we made it to the Da Michele we made a mistake and went to another Da Michele in Naples. I’m a little upset that those people are kind of riding on the good name, but no harm done. The pizza was still good. Just an FYI so that you make sure that you have the right Da Michele address. Julia looks much more lady-like than I do when she’s eating her pizza. Jaime is not amused by my food photography practices. 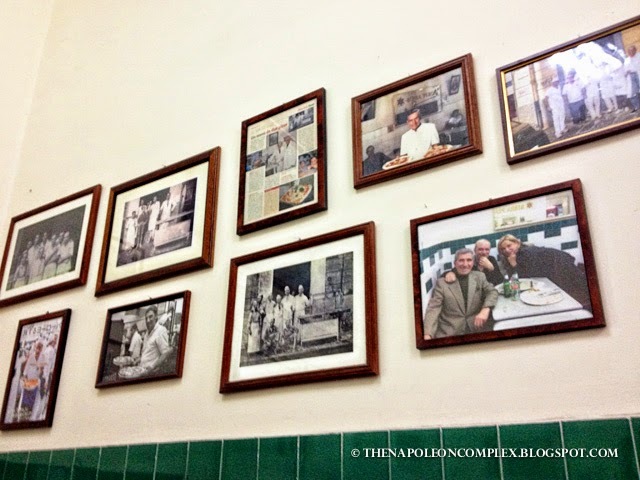 Other pizzerias that are consistently on top 10 lists include Di Matteo, Pizzeria Trianon, and Antica Pizzeria Port’Alba. I haven’t been able to try them personally, but I’ll update this post if I do. After your pizza, you must try a Neapolitan babà. According to Wikipedia the original babà was from France, but I don’t care. 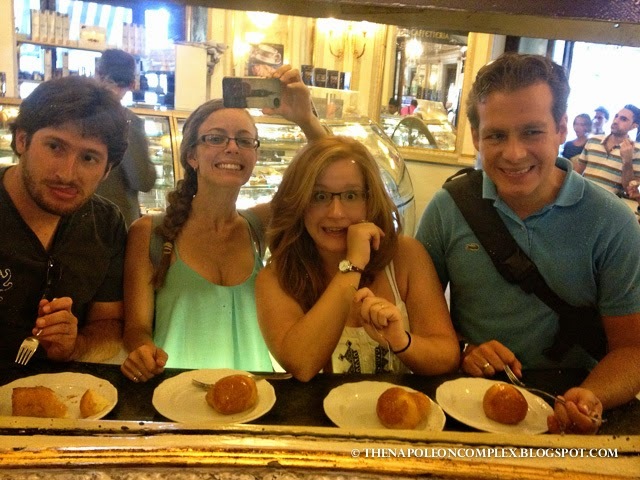 Here in Italy, a babà is known to be Neapolitan. It’s a little sponge cake moistened with rum and its oh, so delicious. 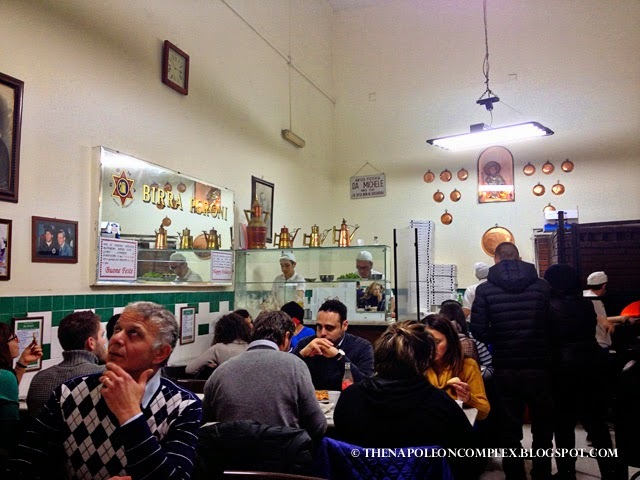 You can find it in any bar in Naples, but we had it in Gran Caffè Gambrinus, where its always packed and they are bringing out fresh trays constantly. 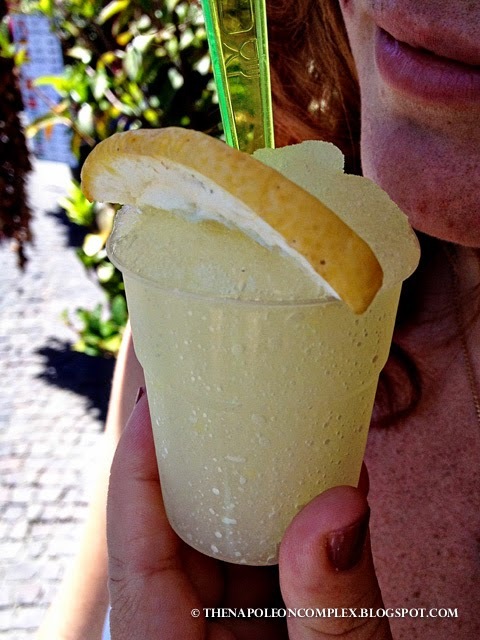 Also, if you visit Naples in the summer, don’t miss out on a fresh lemon granita. They are so good! 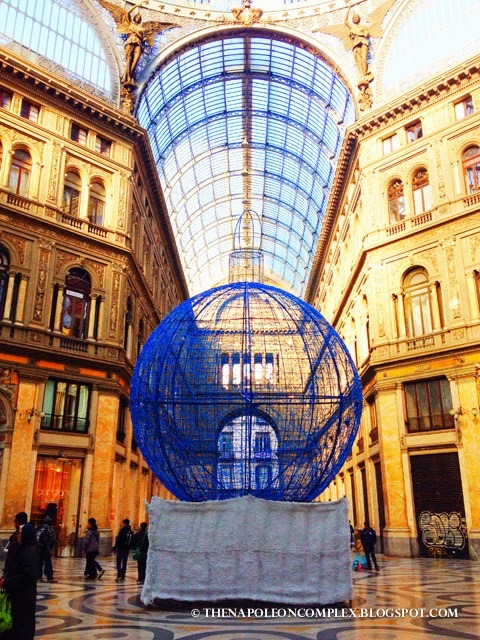 That’s all for my post on Naples, I most likely won’t post again before Christmas, so if you don’t see me until next year, Happy Holidays and Happy New Year!